Education Secretary Betsy DeVos is frequently absent from work - and her calendars and staffing choices raise serious questions about the level of influence that the charter school and for-profit college industries may have at the department. Records to shed light on the influence that for-profit and online colleges have on the agency and policy considerations. Records related to Liberty University containing communications between Secretary DeVos and James Manning, or other officers, employees, or representatives of Liberty University. Education’s discipline policy priorities and its decision to revoke Obama-era guidance on school discipline, especially in light of reports highlighting discipline disparities experienced by black students. Records related to the decision to roll back the Borrower Defense Rule and the Gainful Employment Rule that previously protected students from fraud. Records and communications related to the establishment or activities of the School Safety Commission, which was formed in response to gun violence in schools but has since focused on repealing school discipline policies that protect marginalized students. Records regarding responses to the teacher strikes that took place in early 2018 and communications with the State Policy Network, a group with ties to Secretary DeVos that has been engaged in campaigns to discredit the strikes. Calendars for all senior political appointees, including Secretary DeVos. Calendars, call logs, recusals, or ethics waivers for senior officials Taylor Hansen or Robert Eitel. American Oversight is investigating the influence that Secretary DeVos has allowed for-profit schools and other outside entities to have on the department and its policies. During her first year in office, Betsy DeVos proved that she was unqualified for the job as Secretary of the Department of Education and was out of touch with everyday Americans–just as many thought when DeVos was first nominated. American Oversight obtained copies of her calendars, which revealed that she spent her first six months in office focusing on charter schools, religious schools, and other non-public educational institutions–and took frequent long weekends. We’re investigating the influence that for-profit colleges and religious institutions, like Liberty University, have on Education’s policy priorities. In light of Education’s decision to roll back the Gainful Employment Rule, the Borrower Defense Rule, and Obama-era guidance on school discipline practices, American Oversight is seeking records to determine the extent to which outside special interests influenced these changes. 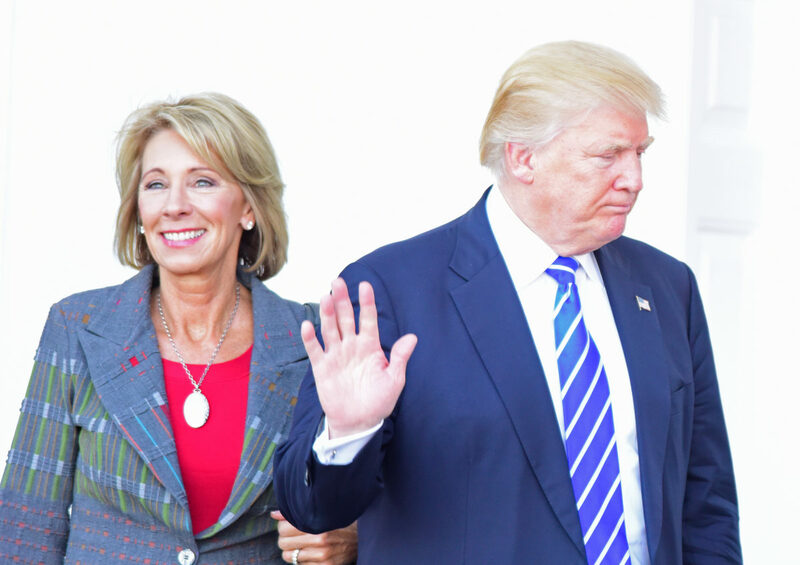 American Oversight's ongoing investigation of the Department of Education has uncovered detailed calendars for Secretary DeVos' past year in office. Those calendars give us a window into Secretary DeVos' priorities, who she and other senior appointees met with, and how they have been managing issues including gun violence, sexual assault on campus, and student lending. American Oversight obtained Education Secretary Betsy DeVos' calendars from her first six months in office. Our analysis found that she took at least 11 long weekends, and she only completed a full day of work about 2/3 of the time. FOIA Request to Department of Education Communications Between Senior Officials and Falwell, Jr.